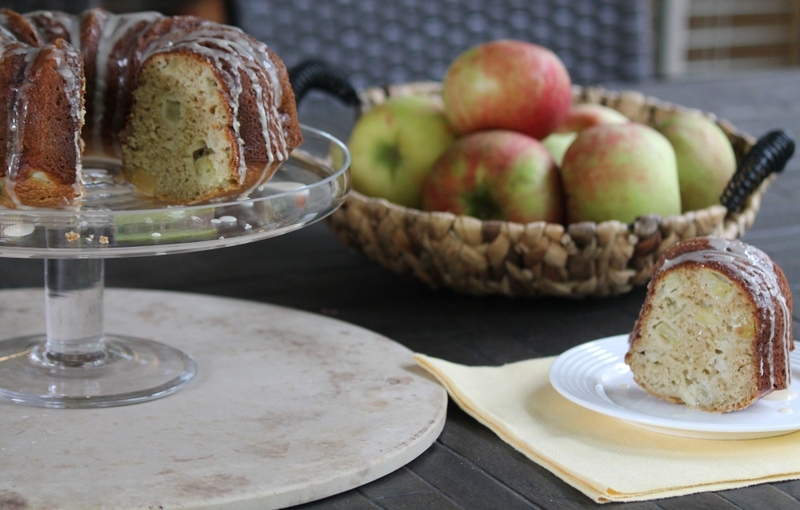 I decided to make this cake last week to use up some of the apples that are currently taking over one of our drawers in the refrigerator. This is one of Jason’s moms recipes that I am pulling out of the archives since I have updated the recipe. Not only did I take new photos but I also made a few changes to some of the ingredients to make it slightly healthier. 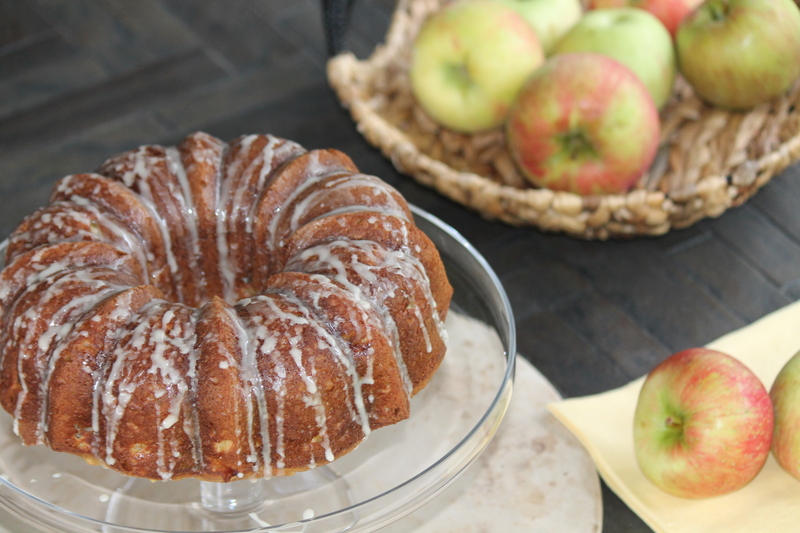 I replaced applesauce for the oil and reduced the sugar from 2 cups to 1 cup since fresh apples baked inside the cake adds some sweetness. The vanilla icing drizzled over top takes it to a whole new level and worth the extra calories it brings to this sweet treat. This Apple Bundt Cake is light and moist, with chucks of apples generously placed throughout. Not only is it delicious but it’s the ultimate in simplicity. 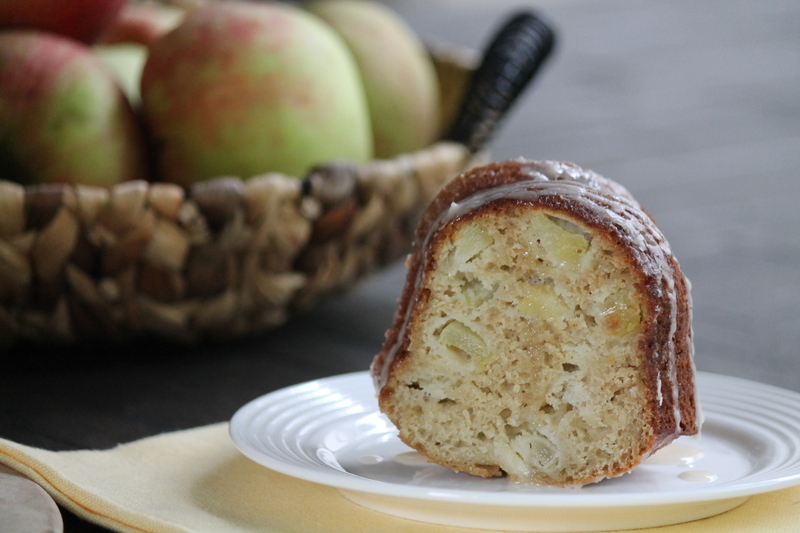 It’s packed with apple goodness making it absolutely perfect for fall. Enjoy it for breakfast alongside a cup of coffee or tea or as a mealtime dessert. Pour applesauce in a large mixing bowl. Add sugar and eggs and mix well. Pour the mixture into a greased bundt cake pan and bake on 350 degrees for 55 to 60 minutes. Recipe Yields 12-16 servings. The nutrition information is calculated by dividing it into 12 servings. Love this lightened-up version – perfect for fall! Yum! This reminds me of an apple cake my mom use to make. Delish! I’ve always wanted to make a bundt cake but I have yet to buy a bundt pan… oops! This sounds great, excited to make a variation of this, if I ever get around to buying a bundt pan! 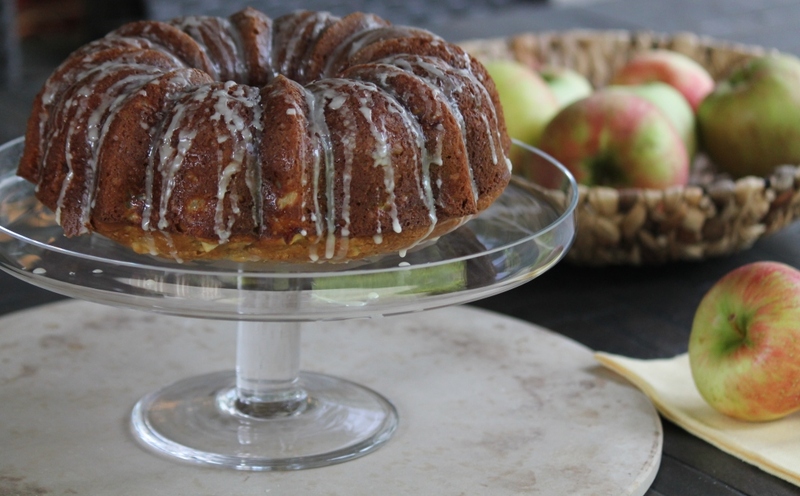 I adore apple bundt cake, and your recipe reminds me that it’s time to break out my bundt pan!